This HERCULES Series Church Chair will add elegance and class to any Church, Hotel, Banquet Room or Conference setting. If you are looking for a chair with comfort and style that is easy to move and stores away with ease, then look no further. This built to last chair has a 16-gauge steel frame that has been tested to hold 600 lbs. This church chair features double support bracing, ganging clamps, a cushion that graduates to a 4.-1/2-inch thick waterfall edge and plastic floor glides to protect non-carpeted floors. 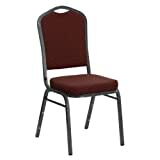 Our church chair is manufactured by one of the most reputable stack chair manufacturers in the industry, you can be assured of the quality of this chair offered to you. [FD-CH02185-SV-JP02-GG]. This functional stack chair can be used in a multitude of environments from small to large. The versatility of the chair makes it appropriate to use in the Church, Offices, and Training Rooms or in the Classroom or Home. The thick padded seat and back will keep users comfortable throughout the duration of the day. Not only is this chair comfortable, but it is very durable with its heavy duty frame with bumper guards that will prevent the finish on the frame from being scratched when stacked. So when in need of temporary or permanent seating this multi-purpose stack chair is sure to meet the needs for any venue. [XU-60153-BK-VYL-GG].